OPPO R7 Lite vs R7 vs R7 Plus. price, specifications and details. The long anticipated R7 from the R7 series has officially hit Malaysian shore at the price of RM1,598. OPPO Malaysia today announced that only 2,000 units of the exclusive R7 will be available in Malaysia at the present time. While R7 is obtainable starting from 12th August 2015, the local headquarter also confirmed that R7 Plus will be available starting from 14th August 2015. Both of these models from the R7 series will be selling in a limited unit for this period of time. Illustrating its product slogan, “Style in a Flash”, the R7 embodies the immaculate functionality and beautiful design. With the VOOC flash charging system that available exclusively in the house, OPPO has made charging speed 4 times faster and safer than conventional chargers by using 5 levels of protective layering from the adaptor to the port and interior of the phone. 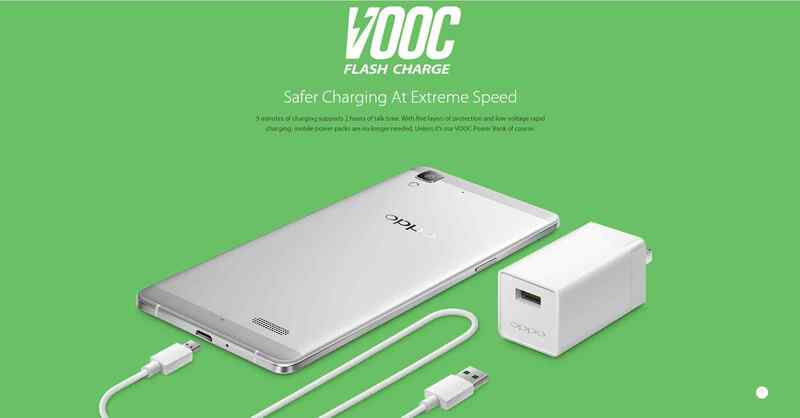 With VOOC Flash Charge, a quick 5 minute charge will enable 2 hours of call time. OPPO has partnered the entire R7 series with 13-megapixel rear camera and 8-megapixel front facing camera; 2.5D screen and magnesium-aluminum alloy uni-body. With the New Flash Shot technology, the OPPO R7 series features the new dual-drive hybrid focus system that comprises of the standard Contrast Detection Autofocus (AF), the new Phase Detection Auto Focus (PDAF) and also smart anti-shake optimization. Being the photography smartphone, the speedy camera of R7 series requires only 0.7 seconds to boot its start-up, and the PDAF function has a remarkable focusing speed reaching up to an astounding 0.1 seconds. Simultaneously, Anti-shake optimization algorithms have also been included in the flagship series to make photos as clear as possible. This ensures rapid launch, fast focus, and stable images. Together with Pure Image 2.0+, the R7 series is capable of taking Ultra-HD photos of up to 50-megapixels. In addition to features such as Beautification 3.0, Super GIF, and Fast Lens, the OPPO R7 series comes loaded with other features, making it a smartphone dedicated to the art of photography. The R7 have equipped with 3GB RAM and 16GB ROM (which memory card expendable up to 128GB), AMOLED screen with 1080p resolution (445 ppi) which make vivid images a delight to explore, and ColorOS 2.1 that has been enhanced for a superior user experience. While R7 Plus is offering dual Nano Sim cards; the R7 and R7 Lite offers Micro SIM + Nano SIM card or Micro SIM + SD Card arrangements. With built-in dual card slots, the R7 can maintain dual SIM standby status any time, allowing you to maintain and manage an easy work-life balance. Previous ArticleOPPO Malaysia reduces prices of R5, R1L and Neo 5! Time to get one for yourself? Why is OPPO F1s the best value smartphone below RM1200. OPPO Find 7 now costs only RM1498!